Today’s marketing challenge is creating vibrant, interactive communities of consumers who make products and brands a part of their daily lives. Learn how to create value and gain loyal customers. Kotler/Armstrong is a comprehensive, classic principles text organized around an innovative customer-value framework. Students learn how to create customer value, target the correct market, and build customer relationships. The changing nature of consumer expectations means that marketers must learn how to build communities in addition to brand loyalty. 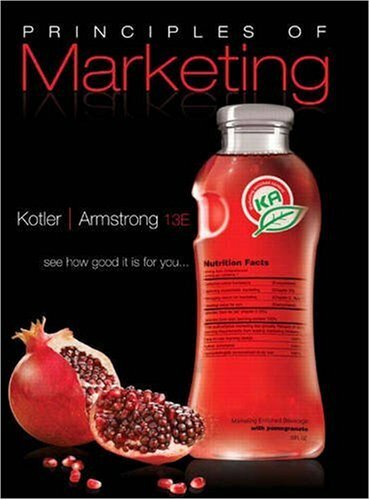 The thirteenth edition of Kotler/Armstrong has been fully updated and redesigned to make the book easier to use. Chapters now contain opening vignettes and accompanying outlines to help students study. Today’s marketers need to make use of all the latest technologies in order to find and capture their market. By creating customer value and building an interactive community, they can develop lasting and profitable relationships with consumers.